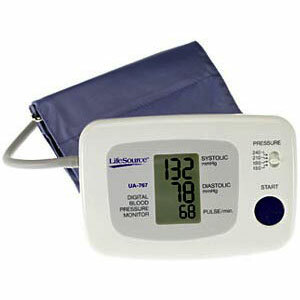 The One Step Auto-Inflation monitor makes self-measurement of blood pressure as easy as a push of a button. Whether the monitor is used to distinguish sustained hypertension from white-coat hypertension, improve patient compliance to treatment or as a preventive health management program, it can all be monitored using only one button. 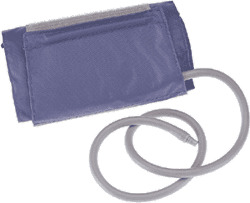 The 16mm digital display makes this monitor easy to read and offers a unique simultaneous readout of systolic and diastolic pressure, and pulse. This monitor is available in two cuff sizes: large and medium (small cuff is available separately). A large print instruction guide and quick start card are clearly written in English, French and Spanish. The LifeSource commitment to quality includes an industry-leading lifetime warranty on all products. Using the correct size cuff is important for an accurate reading. Measure the circumference of your upper arm at the midpoint between the shoulder and elbow. Select the proper cuff size from the chart below.